The Great Lakes® Window brand is a leading manufacturer of high-performance replacement and remodeling windows. With a past deeply rooted in forward thinking, we deliver quality products by working with well-known and respected dealers who are driven to bring homeowners the best windows on the market. 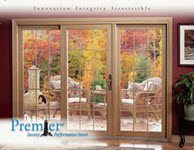 Enhance your home with the luxury and security that only the Premier Sliding Door can offer. Custom made with every detail in mind...our sliding doors offer an array of designer accessories and options to choose from.